Antique Gold Work can incorporate ancient and medieval technologies and provide important dating clues for the switched-on antique jewelry investor. Of the gold-forming techniques used in the History of Jewelry, the gold work applied to antique gold jewelry in the 19th century, was the very finest. In art history, Jewelry travels through a series of specialized gold work techniques, applied at specific time sensitive intervals. When identifying Gold Antique Jewelry, the different gold work applications, will help with the dating. A jewelers loupe will be a good friend in the identification process. (a French Word, however it is thought that Cannetille first originated in England and later adopted in France) and is a recurring decoration in Antique jewelry. Cannetille enhances some of the most impressive antique gold pieces in existence today. This labor intensive technique was unfortunately short-lived and fell out of favor soon after it was introduced and no one has dared take up the difficult process since. During this time semi-precious stones also became fashionable. Amethysts, topaz and aquamarines were set in this beautiful filigree 'Cannetille' antique gold work, that made the most of a small amount of gold. Gold articles so decorated were hand-made but when used on silver or a base metal, the pattern was made by stamping. This style was popular in both England and France during the 1820's. Stones were often foiled for uniformity of color and were set in nests of tightly-curled fine gold wires with trails of tiny gold granules. By 1840, the taste for Cannetille had completely faded and was replaced by a form of gold work called Repoussé. 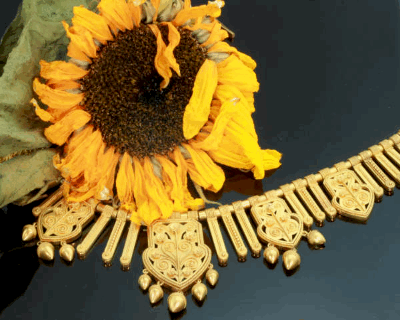 Designs for this style of Gold Jewelry were, scroll-work, strap-work, shells, flowers and leaves. Many of these motifs and patterns established during this pre-Victorian era continued throughout the century. Colored gold mixed with copper provided a red sheen or with silver a green tint and was used for stems and leaves and the matte surface complimented the satin finish of the turquoise or Natural Pearls. Some of the best examples of this kind of can also be seen in the pre-Victorian gentleman's seals which were considered very important items of costume jewelry at the time. Incredible skill and care went into these important accessories. Gold on both massive or minute seals was richly chased into flowers, leaves, seashell motifs, animals or coiled serpents. Major archaeological discoveries from the middle of the century re-introduced a lost new 'archaeological style' of antique gold work known as Granulation. (See Image Above) While genuine ancient examples had occasionally been seen in society such as the newly discovered Etruscan pieces worn by Lucien Bonaparte's wife in Rome in the 1830s, these were rare. The finest jewelry from the ancient world was created by the Etruscans who had settled in Tuscany in Italy in the late 8th century BC. Their reputation rests primarily on their unequaled mastery of the difficult ancient gold work technique of Granulation, that created superb, textured surface patterning, on their gold work. Minute gold spheres were heated to melting point (sometimes as small as 0.14mm) and then attached to the gold surface below without melting the surface. This technique had largely been a mystery until the 1930s. It was then discovered that a mixture of copper carbonate, water and fish glue was used to hold the granules in place and on heating the copper fused with the gold to create a solder-less joint. The process could create simple geometric patterns and intricate scenes to cover whole areas. It looked like fine gold dust! There was a revival in 'archaeological style' jewelry in the 1860s following excavation in Italy and the Crimea. A number of European jewelers became famous for their close copies. One of the most important working in the archaeological style and using antique gold work techniques of Granulation was Fortunato Pio Castellani (1793-1865) followed by his two sons, Alessandro (1824-83) and Augusto (1929-1914). Casellani's work was inspired by Etruscan and Greek originals. They kept up to date with the new archaeological discoveries and were able to amass a great collection of Etruscan, Greek and Roman gold work. Their knowledge of ancient jewelry won them international reputation. Castellani of Rome had shops in London and Paris. Ancient gold work was often heavily embossed with details in intricate gold filigree and fine granules. And although Castellani did not achieve an exact replication of the Etruscan technique he achieved a pretty close match using solder. Antique jewelry investors can identify ancient 'archeological style' jewelry often by the antique gold work on it's surface. I hope you enjoyed reading this page. More information about ancient archaeological style jewelry and gold work will be added shortly.